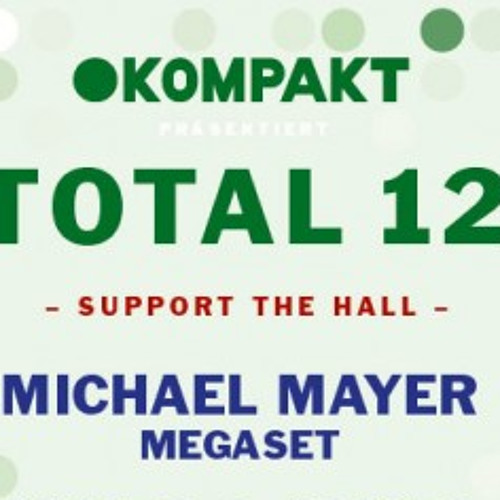 Kompakt's Total 12 party was an unusual one: instead of going over last year's top by putting at least half a dozen artists on some massive stage, we took it down an octave and opted for a true underground experience at Cologne's late Halle Deutz-Air. The intimate, low-key atmosphere, that this legendary location always perpetuated, proved to be the perfect accompaniment to the lush DJ set played by Michael Mayer, the de facto only artist booked for that night. In over 12 hours of playtime, Kompakt's main maestro didn't just go through the motions, but orchestrated a highly diversified array of electronic bliss, sending his listeners on a trip to the many landscapes of the Sound Of Cologne. Starting things off with succulent ambitronics followed by cutting-edge floorthrashers both old- and nuschool, Michael backed up every single phase of the party, shifting gears when needed, but always sticking to his narrational goals. It is with great joy that we present you this exceptional piece of work in its entirety, divided in three parts (comprised of individual streams) and released on Kompakt's Soundcloud as part of our Advent Calendar. Every sunday up to christmas, you'll get one third of the whole set: feel free to stream and share, listen and dance.